In the words of film critic Roger Ebert, “Some filmmakers are born. Ingmar Bergman was made. 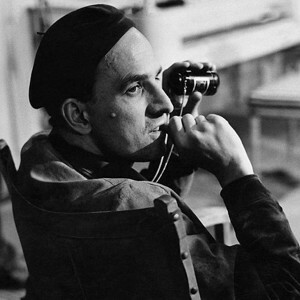 Self-made.” Ingmar Bergman is recognized as one of the most accomplished and influential auteurs of all time. He directed over sixty films for cinematic release and for television, most of which he also wrote. He also directed over 170 plays and from 1953 forged a powerful creative partnership with his full-time cinematographer Sven Nykvist. Bergman was born in 1918 in Uppsala, was the son of a Lutheran minister and was raised with a strict and intense religious upbringing. Since Bergman’s father was a clergyman Bergman described his home as a fortress of restriction, repeatedly being locked up in dark closets for ‘infractions’ like wetting the bed. Growing up, young Bergman became fascinated by the morbid themes of death and the bleak side of humanity which brought upon his fascination with Adolf Hitler and the horrors of the holocaust. 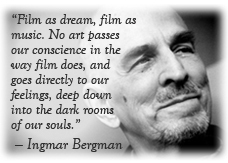 Even though he was raised in a devout Lutheran household, Bergman later stated that he lost his faith at age eight, and only came to terms with this fact while filming Winter Light in 1963. Bergman originally started out working in the theater, but it was only when he began to direct films, most famously his earlier works Sawdust and Tinsel (1953) and The Magician (1958), you could finally see Bergman’s brooding and ghastly themes start to seep into his storylines. His big break came with Smiles of a Summer Night (1955), which became not only one of the few comedies Bergman ever directed, but the one commercial success that made him finally known to filmgoers. Because of the films success, Swedish studios gave Bergman more artistic freedom to choose the projects he wanted to do. In 1957 Bergman directed two of his most acclaimed films, The Seventh Seal and Wild Strawberries. Both films were well received but it was The Seventh Seal that would forever establish Bergman as a world-renowned director. The boldness of The Seventh Seal’s religious, ethical concerns on death, illness, faith, insanity and the absence of God was immediately apprehensible to people who were just beginning to discover the art of cinema at the time. With the rise of the ‘Auteur Theory’ The Seventh Seal suddenly was the quintessential art film of high school and college literature courses, and the iconic shot of Death playing chess with a Knight became a landmark in pop culture. Throughout the 60’s and 70’s Bergman began to modify such grim and existential subject matters by choosing much more thought provoking, psychological and complicated films like Persona (1966), Cries and Whispers (1972) and Scenes from a Marriage (1973). When making his epic swan song Fanny and Alexander in 1982 Bergman brought both the world of the stage and the cinema together, creating his most richly orchestrated work and splendor. The brilliant and philosophical Ingmar Bergman who had long mediated on his fears of death, as it became the subject in many of his greatest films, died at the age of 89 on his remote island of Fårö.